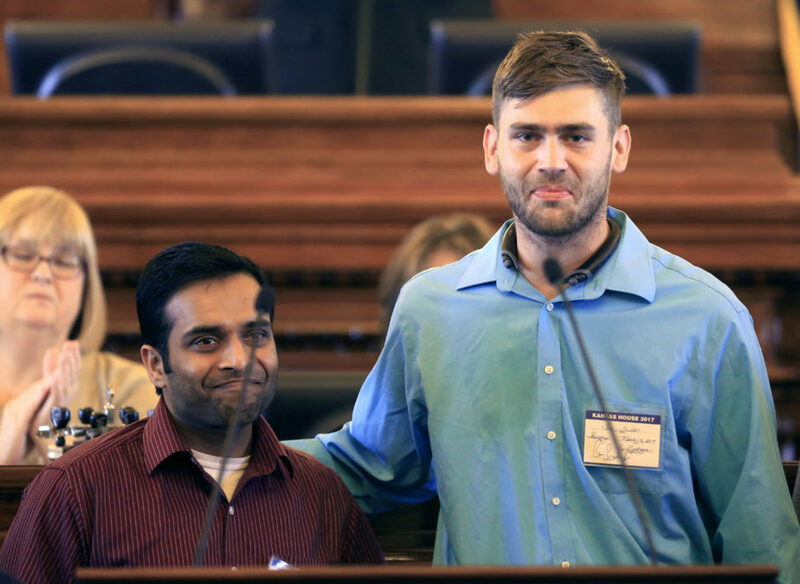 Alok Madasani (left) and Ian Grillot embrace after they were honored by the Kansas House of Representatives. They are survivors of a shooting at a Kansas bar that killed immigrant Srinivas Kuchibhotla. This week, Reveal embarked on a newsroomwide project digging into immigration in the United States. We’ve explored how increased immigration enforcement is negatively affecting children’s health, tallied the numbers of lives affected by the policy changes, showed how fake lawyers are taking advantage of vulnerable immigrants, compiled 10 can’t-miss immigration investigations and devoted an episode of our weekly public radio show to answering listeners’ questions about immigration. In this edition of The Hate Report, we’re looking into the torrent of hate that has flowed through America since Donald Trump was elected and how deportation fears are scaring immigrant communities away from reporting being victimized. From his earliest moments on the presidential campaign trail, Donald Trump has aimed for the jugular on immigration. The man who launched his political career by questioning the citizenship of President Barack Obama soon gained a reputation for calling immigrants everything from rapists to animals. How this rhetoric oozes into the lives of millions of immigrants – both those who’ve entered the country legally and those who haven’t – is difficult to measure. But over the last 18 months, we’ve been cataloguing some of the worst incidents of malice, hate and violence against immigrants in The Hate Report. In February 2017, a Kansas man yelled, “Get out of my country,” before opening fire at a restaurant, killing an Indian immigrant. Adam Purinton since has pleaded guilty and was sentenced to life in prison. Less than two weeks later, a Seattle-area Sikh man was working in his driveway when a masked man yelled, “Go back to your own country,” before shooting him in the arm. The same month, an employee of a Middle Eastern restaurant in Oregon was attacked by someone who screamed, “Go back to your country,” during the assault. The following month, there were two violent attacks on women wearing hijabs. A woman in Los Angeles was beaten and a woman in Milwaukee was cut with a knife. In November, a Denver man shot and killed three people of Latino descent at a Walmart in an attack that police believe was driven by hatred of immigrants. The same week, a Jordanian restaurant in Wichita, Kansas, was burned down. Someone spray-painted “go back” on the building. A young man who shot and killed two classmates in Albuquerque, New Mexico, in February had “build wall,” an apparent reference to a Trump campaign slogan and chant, written on his leg. These violent attacks and others are in addition to a weekly drip of dozens of hate-driven graffiti and vandalism cases directed toward immigrants that we’ve covered in The Hate Report. Like the Florida man who tried to burn down a convenience store in March 2017 because he wanted to “run Arabs out of our country.” Or a case in Cincinnati in February in which someone spray-painted “go home,” “terrorist” and “Trump America” on an SUV. In April, we uncovered a troubling trend: scores of hate incidents across the country in which the perpetrators invoked Trump’s name. Of the more than 150 cases we found in ProPublica’s Documenting Hate database, 75 involved attacks on immigrants. From Southern California to northern Minnesota, children, adults, veterans and people whose families have lived in the U.S. for generations have been told that the president is coming for them and that they soon will have to leave. Earlier this week, Thomas Homan, acting director of U.S. Immigration and Customs Enforcement, spoke at an event hosted by the Center for Immigration Studies. The influential anti-immigration organization has been labeled as a hate group by the Southern Poverty Law Center for circulating the work of white nationalist authors and promoting largely inaccurate narratives tying nonwhite immigrants to criminality. “We are extremely disturbed that ICE Acting Director Homan participated this week in an event hosted by CIS, an extreme anti-immigrant organization with deep, longstanding ties to racists,” Erika Moritsugu, an Anti-Defamation League vice president, said in a statement. The Center for Immigration Studies was founded in 1985 by retired ophthalmologist John Tanton. He also founded a number of groups, such as NumbersUSA, that have pushed for reducing Latino immigration into the U.S. In a Washington Post op-ed, Mark Krikorian, executive director of the Center for Immigration Studies, pushed back against allegations that his group is pushing hate, saying the categorization is designed to shut down legitimate policy debate. “The wickedness of the SPLC’s blacklist lies in the fact that it conflates groups that really do preach hatred, such as the Ku Klux Klan and Nation of Islam, with ones that simply do not share the SPLC’s political preferences,” he wrote, adding that Tanton has not been materially involved in the organization for a long time. Homan’s speech this week isn’t the Department of Homeland Security’s only connection to the Center for Immigration Studies and associated groups. Jon Feere, a former policy analyst for the center, was appointed as an adviser to Homan last year. Julie Kirchner, former executive director at the Tanton-founded Federation for American Immigration Reform, is now the ombudsman at U.S. Citizenship and Immigration Services, charged with assisting immigrants who have run into complications navigating the agency’s complex bureaucracy. This wave of hate washing over immigrant communities has collided with another phenomenon: People living in the U.S. without authorization are becoming increasingly unwilling to report crimes to law enforcement. While this certainly has occurred before, the president’s rhetoric about mass deportation and a spike in arrests for immigration offenses has created an environment of widespread suspicion of all law enforcement officials. So how can local governments keep vulnerable residents safe from hate when those residents want to stay as far away from authorities possible? A possible solution may reside in Portland, Oregon, which has teamed with dozens of local nonprofit organizations to create Portland United Against Hate, a coalition aimed at helping victims navigate the aftermath of hate attacks. Launched in the wake of the 2016 presidential election, the coalition has developed a system in which, if a victim wants to seek justice through the legal system, a professional advocate can tell the person what to expect and even serve as a liaison between the victim and police. The coalition also can provide victims with resources, such as free therapy offered by a local university, that don’t put them at risk of deportation. The program is scheduled for a full launch in the coming weeks. While the program hasn’t formally launched yet, there are signs that Portlanders are being encouraged to step out of the shadows and report hate crimes. Coordinator Kari Koch said her group has received more reports of hate crimes in the last month than the Portland Police Bureau reported in all of 2016. A glance to the north, in the Seattle suburb of Tukwila, Washington, provides an instructive example of why immigrants may be unwilling to report being victimized and how cities are struggling to regain lost trust. Wilson Rodriguez Macarreno came to the U.S. in 2004, fleeing gang violence in his native Honduras. After being stopped at the border, immigration officials allowed Macarreno into the country, but told him that he would receive a letter about where and when he could plead his asylum case in court. That letter, he insists, never came. Macarreno missed his court date, and a warrant was issued for his arrest. Earlier this year, Macarreno discovered an intruder on his property and called police. The officers let the intruder off with a warning, but ran Macarreno’s name through their system, which showed the outstanding warrant. Macarreno was sent to a nearby immigration detention center, where he still resides four months later, leaving his three young children without a father. During the incident, police also inquired about the immigration status of Macarreno’s co-worker, who also saw the prowler, but the co-worker’s name didn’t ring any alarm bells, so he was let go. The Tukwila Police Department issued a statement saying it no longer would assist ICE with deportations, but the damage already was done. “This sends a message to the community that if you are undocumented, or a member of your household has problems with their immigration status, you can’t call up the police because they’re not there to protect you, they’re there to work with immigration authorities,” said Matt Adams, a lawyer with the Northwest Immigrant Rights Project, which is representing Macarreno in a lawsuit against against the city of Tukwila. Want to help up investigate the world of hate? Sure you do. Sign up for that here. In February 2017, a Kansas man yelled, “Get out of my country,” before opening fire at a restaurant, killing an Indian immigrant. Adam Purinton since has pleaded guilty and was sentenced to life in prison. Less than two weeks later, a Seattle-area Sikh man was working in his driveway when a masked man yelled, “Go back to your own country,” before shooting him in the arm. The same month, an employee of a Middle Eastern restaurant in Oregon was attacked by someone who screamed, “Go back to your country,” during the assault. The following month, there were two violent attacks on women wearing hijabs. A woman in Los Angeles was beaten and a woman in Milwaukee was cut with a knife. In November, a Denver man shot and killed three people of Latino descent at a Walmart in an attack that police believe was driven by hatred of immigrants. The same week, a Jordanian restaurant in Wichita, Kansas, was burned down. Someone spray-painted “go back” on the building. A young man who shot and killed two classmates in Albuquerque, New Mexico, in February had “build wall,” an apparent reference to a Trump campaign slogan and chant, written on his leg.